Pins – Clover’s extra-fine glass head patchwork pins are my favorite. 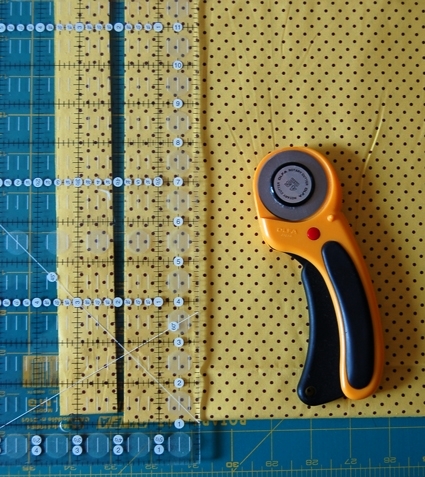 The more pins you have the quicker you’ll be done! Rotary Cutter – Olfa’s 45 mm deluxe rotary cutter is my first choice for safety and quality. Sewing Machine – The binding is attached with a sewing machine. 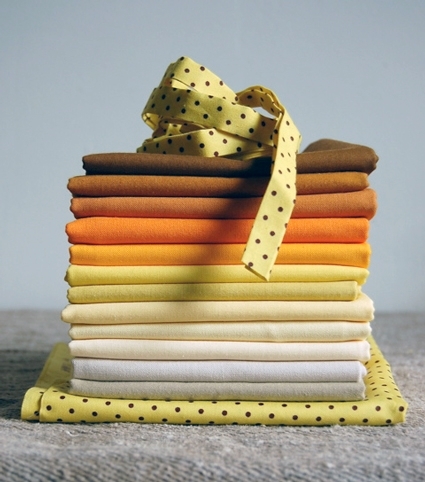 Pre Wash Fabrics – First things first, please pre wash and dry all fabrics! If you need extra encouragement, look what happened when I didn’t pre wash my fabrics for my last project here. 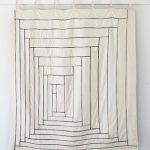 Cut Napkin Fabrics – Cut 16″ squares out of each napkin fabric. 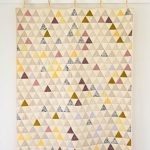 If you are using fat quarters (18″ x 22″) you will get one napkin from each piece. 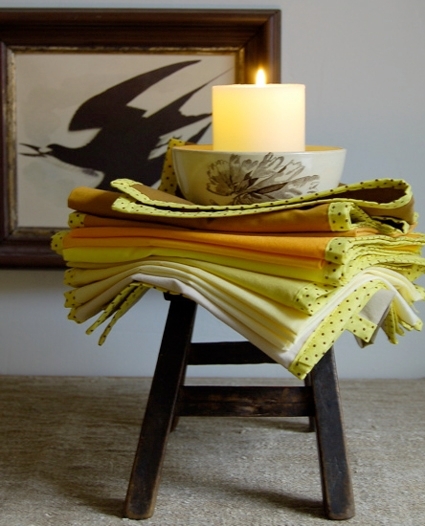 If you are using 1/2 yards (18″ x 44″) you can get two napkins from each piece. Cut Binding Strips – You don’t need to cut your strips on the bias. In order to make long strips (so you don’t have to piece them together for each napkin) make your cuts parallel to the selvages rather than perpendicular to the selvages as you normally would. For the 1″ bias tape maker, cut your strips to 1 3/4″ wide. 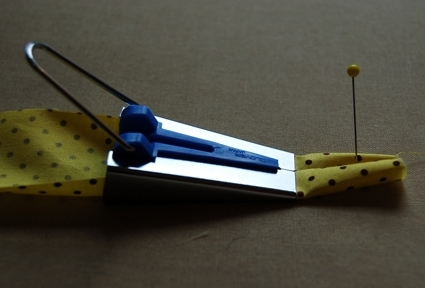 If you’ve never seen a bias tape maker before, here is what it looks like and how you use it. Slip the binding strip into the large end of the tape maker wrong side up. 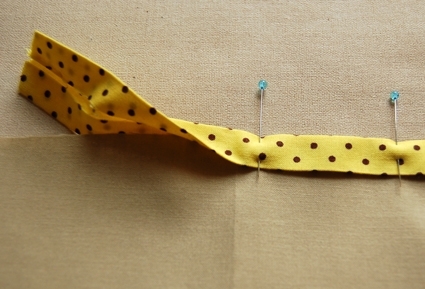 Use a straight pin to pull the fabric through to the small end. Pin end to your ironing board. Pull tape maker along the strip, pressing it flat as it comes out of the small end. 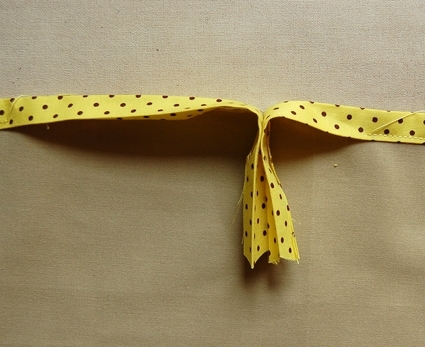 Once you’ve pressed the entire strip, fold it one more time along its length and press the crease into place. 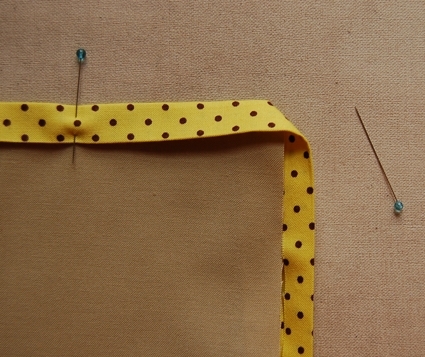 Begin pinning the binding into place, leaving the first few inches free so that you’ll be able to finish the ends nicely. Pin to the corner and fold binding downwards to form the corner. Fold binding around the corner and pin into place. Repeat at 3 remaining corners. 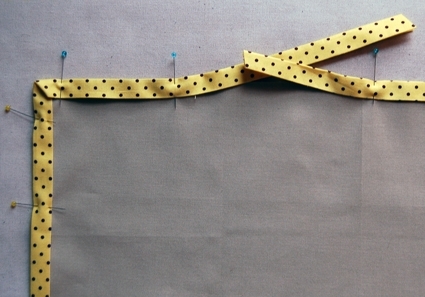 Leave the end of the strip loose so that you’ll be able to finish your binding neatly. 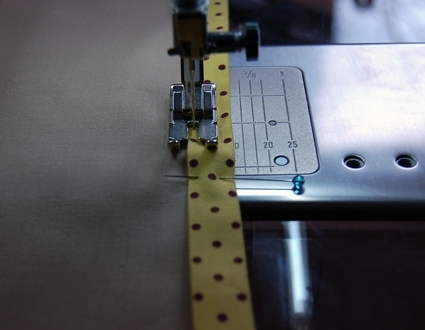 Once you’ve pinned the binding into place, sew the binding to the napkin, about 1/8″ from the its left edge. 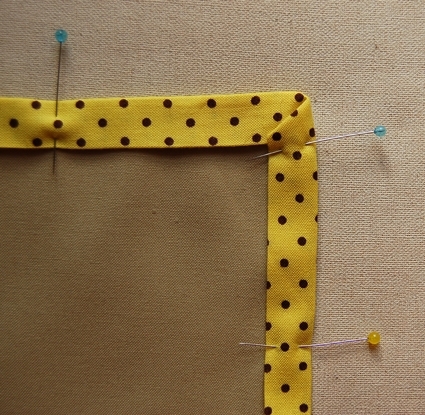 Begin at your first pin with a few backstitches, sew to the corner. When you come to the corner, leave your needle in the down position, lift the presser foot and rotate napkin 90 degrees. Lower presser foot and sew to next corner. Repeat for all corners, end at your last pin with a few backstitches. 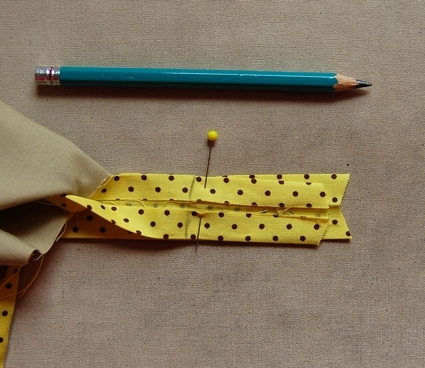 Fold ends down with right sides together to determine where you’ll need to sew them together. 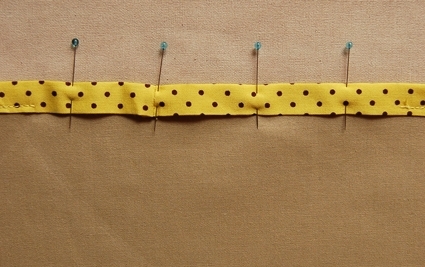 Mark your seam on the wrong side and pin into place. Sew along the line. 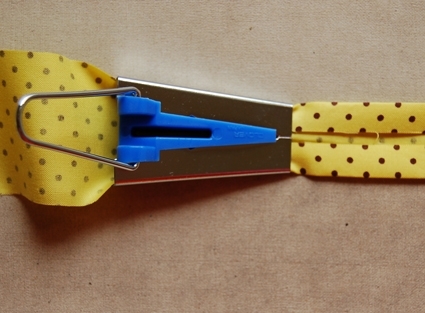 Trim loose ends to 1/4″, and press open. 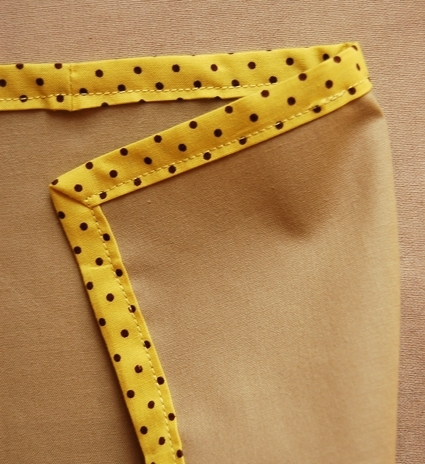 If necessary, trim corners of seam allowance so they don’t poke out on the front. Pin binding into place. Sew remaining opening, beginning and ending with a few backstitches. 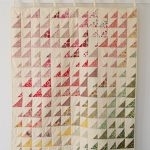 This is a wonderful turtorial for making cloth napkins. I just might be making these as Christmas presents and to replace the paper napkins in the house. Thank you so much for your awesome tutorial! I got totally inspired and made 32! It started with a 18-piece set to match a tablecloth I had never found napkins for. 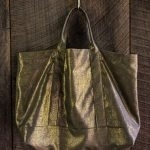 Then it was a 6-piece set when I thought batiks would make awesome edges (they did). Then I made color-coded ones for our little family, and iron-on transferred names too for the little ones to learn their names. Now that you’ve helped me master the bias tape doodad, I’m on a tear! I did find that bottomweights make great napkin material, heavy, absorbent, like at fine restaurants. Anyway, it takes time to make a great tutorial, so thanks for the excellent text and inspiring photos! Thank you so much for sharing your directions for making cloth napkins. We have two growing children in the home so; ergo, for my first cloth napkins I purchased cheep washcloths and we're using those. I like the fabric but would like something more “cute” to use. I like this pattern and the one just before with the two different colors and the pretty way you folded them with the dinner wear in the napkin. I rescently purchased several one and two yard cuts of fabric from Wal Mart for about 75cents a yard and thought I could make these. My question for you is, do they wape kids hands and faces well with pizza or syrup? They get the good stuff all over the place you know. *smile* Thanks. Mommy of two little blessings & so much more! Thank you for this tutorial. It has helped me teach my 16 year old daughter how to sew her own cloth napkins. It is a fun quick project to do together. Great instructions. I have made bias tape using 2 inches of fabric for the 1 inch tape maker, but had too much fabric and did not fold neatly. Your method used 1 3/4 inches of fabric and it folded perfectly. I also liked the way you finished the final seam. Clever.